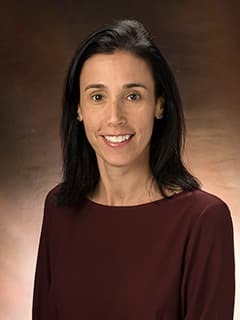 Jami Finkelson Young, PhD, is a psychologist and Director of Psychosocial Research in the Department of Child and Adolescent Psychiatry and Behavioral Sciences at CHOP. Young, J. F., Benas, J. S., Schueler, C. M., Gallop, R., Gillham, J. E., Mufson, L.: A randomized depression prevention trial comparing Interpersonal Psychotherapy - Adolescent Skills Training to group counseling in schools. Prev Sci. 2016 Apr;17(3):314-24. Tanofsky-Kraff, M., Shomaker, L. B., Young, J. F., Wilfley, D. E.: Interpersonal psychotherapy for the prevention of excess weight gain and eating disorders: A brief case study. Psychotherapy (Chic). 2016 Jun;53(2):188-94. Tanofsky-Kraff, M., Crosby, R. D., Vannucci, A., Kozlosky, M., Shomaker, L. B., Brady, S. B., Sbrocco, T., Pickworth, C. K., Stephens, M., Young, J. F., Olsen, C. H., Kelly, N. R., Radin, R., Cassidy, O., Wilfley, D. E., Reynolds, J. C., Yanovski, J. A.: Effect of adapted interpersonal psychotherapy versus health education on mood and eating in the laboratory among adolescent girls with loss of control eating. Int J Eat Disord. 2016 May;49(5):490-8. Miller, A. B., Jenness, J. L., Oppenheimer, C. W., Gottlieb, A. B., Young, J. F., Hankin, B. L.: Childhood emotional maltreatment as a robust predictor of suicidal ideation: A 3-year multi-wave, prospective investigation. J Abnorm Child Psychol. 2016 Mar 31. Kranzler, A., Young J. F., Hankin, B. L., Abela, J. R. Z., Elias, M. J., Selby, E. A.: Emotional awareness: A transdiagnostic factor in depression and anxiety for children and adolescents. J Clin Child Adolesc Psychol. 2016;45(3):262-9. Jenness, J. L., Hankin, B. L., Young, J. F., Smolen, A.: Stressful life events moderate the relationship between genes and biased attention to emotional faces in youth. Clin Psychol Sci. 2016 May;4(3):386-400. Gulley, L. D., Hankin, B. L., Young, J. F.: Risk for depression and anxiety in youth: The interaction between negative affectivity, effortful control, and stressors. J Abnorm Child Psychol. 2016 Feb;44(2):207-18. Arnett, A. B., Pennington, B. F., Young, J. F., Hankin, B. L. Effects of within-person variance in hyperactivity/attention problems on subsequent conduct problems in youth. Journal of Child Psychology and Psychiatry 57: 502-509, 2016. Snyder, H. R., Gulley, L. D., Bijttebier, P., Hartman, C. A., Oldehinkel, A. J., Mezulis, A., Young, J. F., Hankin, B. L.: Adolescent emotionality and effortful control: Core latent constructs and links to psychopathology and functioning. J Pers Soc Psychol. 2015 Dec;109(6):1132-49. Hankin, B. L., Young, J. F., Abela, J. R., Smolen, A., Jenness, J. L., Gulley, L. D., Technow, J. R., Gottlieb, A. B., Cohen, J. R., Oppenheimer, C. W.: Depression from childhood into late adolescence: Influence of gender, development, genetic susceptibility, and peer stress. J Abnorm Psychol. 2015 Nov;124(4):803-16. Hankin, B. L., Barrocas, A. L., Young, J. F., Haberstick, B., Smolen, A.: 5-HTTLPR x interpersonal stress interaction and nonsuicidal self-injury in general community sample of youth. Psychiatry Res. 2015 Feb 28; 225(3): 609–612. Hankin, B. L., Badanes, L. S., Smolen, A., Young, J. F.: Cortisol reactivity to stress among youth: Stability over time and genetic variants for stress sensitivity. J Abnorm Psychol. 2015 Feb; 124(1): 54–67. Cohen, J. R., Spiro, C. N., Young, J. F., Gibb, B. E., Hankin, B. L., Abela, J. R. Z.: Interpersonal risk profiles for youth depression: A person-centered, multi-wave, longitudinal study. J Abnorm Child Psychol. 2015 Nov; 43(8): 1415–1426. Tanofsky-Kraff, M., Shomaker, L., Wilfley, D. E., Young, J. F., Sbrocco, T., Stephens, M., Razenhofer, L. M., Elliot, C., Brady, S., Radin, R. M., Vannucci, A., Bryant, E. J., Osborn, R., Berger, S. S., Olsen, C., Zozlosky, M., Reynolds, J. C., Yanovsky, J. A.: Targeted prevention of excess weight gain and eating disorders in high-risk adolescent girls: A randomized, controlled trial. Am J Clin Nutr. 2014 Oct; 100(4): 1010–1018. Holm-Denoma, J. M., Hankin, B. L., Young, J. F.: Developmental trends of eating disorder symptoms and comorbid internalizing symptoms in children and adolescents. Eat Behav. 2014 Apr;15(2):275-9. Hazel, N. A., Oppenheimer, C. W., Technow, J. R., Young, J. F., Hankin, B. L.: Parental social support buffers the relationship between peer stress and depressive symptoms from middle childhood to adolescence. Dev Psychol. 2014 Aug;50(8):2115-23. Cohen, J. R., Young, J. F., Gibb, B. E., Hankin, B. L., Abela, J. R. Z.: Why are anxiety and depressive symptoms comorbid in youth? A multi-wave, longitudinal examination of competing etiological models. J Affect Disord. 2014 Jun;161:21-9. Cohen, J. R., Spiegler, K. M., Young, J. F., Hankin, B. L., Abela, J. R. Z.: Self-structures, negative events, and adolescent depression: Clarifying the role of self-complexity in a prospective, multiwave study. J Early Adolesc. 2014 Aug;34(6):736-759. Cohen, J. R., Sheshko, D. M., Ames, A. M., Young, J. F., Hansford, A. P., Yao, S., Abela, J. R. Z.: Self-perceived competence in mainland China: A multi-wave longitudinal examination of prospective internalizing symptoms in Chinese youth. Journal of Research on Adolescence 25: 564-579, 2014. Berger, S. S., Elliott, C., Ranzenhofer, L., Shomaker, L. B., Hannallah, L., Field, S., Young, J. F., Sbrocco, T., Wilfley, D. E., Yanovski, J., Tanofsky-Kraff, M.: Interpersonal problem areas and alexithymia in adolescent girls with loss of control eating. Compr Psychiatry. 2014 Jan;55(1):170-8. Young, J. F., Benas, J., McCarthy, A., Haimm, C., Huang, M., Mufson, L., Gillham, J., Gallop, R.: Examining transdiagnostic outcomes from the depression prevention initiative. Paper presented at the annual meeting of the Society for Prevention Research, San Francisco, CA, May, 2016. Young, J. F., Benas, J., McCarthy, A., Haimm, C., Huang, M., Mufson, L., Gillham, J., Gallop, R.: The depression prevention initiative: Impact on internalizing and externalizing symptoms. Paper presented at the annual meeting of the Association for Behavioral and Cognitive Therapies, Chicago, IL, November, 2015. Tanofsky-Kraff, M., Shomaker, L. B., Wilfley, D. E., Young, J. F., Sbrocco, T., Stephens, M., Brady, S. M., Radin, R. M., Pickworth, C. K., Olsen, C., Kozlosky, M., Reynolds, J. C., Yanovski, J. A.: Targeted prevention of excess weight gain in high-risk adolescent girls with loss of control (LOC) eating: The role of anxiety in three year outcomes of a randomized, controlled trial. Paper presented at the annual meeting of The Obesity Society, Los Angeles, CA, November, 2015. Spiro, C. N, Young, J. F., Gallop, R.: Do interpersonal variables moderate outcomes in a randomized depression prevention trial? Poster presented at the annual meeting of the Association for Behavioral and Cognitive Therapies, Chicago, IL, November, 2015. Radin, R. M., Tanofsky-Kraff, M., Shank, L. M., Pickworth, C. K., Brady, S. M., Armaiz-Flores, S. A., Stephens, M., Sbrocco, T., Young, J. F., Wilfley, D. E., Olsen, C., Kozlosky, M., Reynolds, J. C., Yanovski J. A.: Remission of loss of control (LOC) eating is associated with improvements in low-density lipoprotein cholesterol (LDL-C) and high-density lipoprotein cholesterol (HDL-C) in adolescent girls. Poster presented at the annual meeting of The Obesity Society, Los Angeles, CA, November, 2015. Mendel, C. A., Huang, M., Haimm, C., Young, J. F.: Training school counselors in Interpersonal Psychotherapy-Adolescent Skills Training (IPT-AST): An examination of barriers to and facilitators of implementation. Poster presented at the annual meeting of the Association for Behavioral and Cognitive Therapies, Chicago, IL, November, 2015. McCarthy, A., Huang, M. Young, J., Benas, J., Gallop, R.: School-related outcomes from a randomized controlled trial of depression prevention programs. Poster presented at the annual meeting of the Association for Behavioral and Cognitive Therapies, Chicago, IL, November, 2015. Huang, M., McCarthy, A., Young, J. F., Gallop, R.: The impact of prevention programs on dependent stress in adolescence. Poster presented at the annual meeting of the Association for Behavioral and Cognitive Therapies, Chicago, IL, November, 2015. Cohen, J. R., Spiro, C., Young, J., Gibb, B., Hankin, B., Abela, J. R.: Interpersonal risk profiles for youth depression: A person-centered, multiwave, longitudinal study. Paper presented at the annual meeting of the Association for Behavioral and Cognitive Therapies, Chicago, IL, November, 2015. Young, J. F., Huang, M., Haimm, C. McCarthy, A., Benas, J., Mufson, L., Gillham, J., Gallop, R.: Interpersonal Psychotherapy-Adolescent Skills Training: Results from the depression prevention initiative. Paper presented at the annual meeting of the American Academy of Child and Adolescent Psychiatry, San Antonio, TX, October, 2015. Young, J. F., Mufson, L., Gillham, J., Gallop, R., Benas, J., Schueler, C., Gallop, R.: The depression prevention initiative: Outcomes from a school-based randomized controlled trial comparing IPT-AST and group counseling. Paper presented at the biennial meeting of the International Society for Interpersonal Psychotherapy, London, UK, June, 2015. Young, J. F., Spiro, C., Anderson, M., Benas, J., Schueler, C., Gallop, R.: Depression prevention initiative: Changes in social adjustment and social skills through 6-month follow-up. Paper presented at the biennial meeting of the Society for Research on Child Development, Philadelphia, PA, March, 2015. Young, J. F., Mufson, L., Schueler, C.: Interpersonal Psychotherapy – Adolescent Skills Training: A group depression prevention program. Institute presented at the annual meeting of the Association for Behavioral and Cognitive Therapies, Philadelphia, PA, November, 2014. Spiro, C. N., Anderson, M., Shesko, D., Young, J. F., Gallop, R.: Changes in social functioning in youth following two indicated depression prevention programs. Poster presented at the annual meeting of the Association for Behavioral and Cognitive Therapies, Philadelphia, PA, November, 2014. Benas, J. S., Anderson, M., Huang, M., Schueler, C., Makover, H., Young, J. F., Gallop, R.: The depression prevention initiative: Using multi-informant reports to measure changes in internalizing and externalizing symptoms. Poster presented at the annual meeting of the Association for Behavioral and Cognitive Therapies, Philadelphia, PA, November, 2014. Anderson, M. Young, J. F.: Correlates of mindfulness across the span of adolescence. Poster presented at the annual meeting of the Association for Behavioral and Cognitive Therapies, Philadelphia, PA, November, 2014. Anderson, M., Natale, N., Benas, J., Young, J. F., Gallop, R.: Comparing social skills outcomes in adolescent depression preventive interventions. Poster presented at the annual meeting of the Association for Behavioral and Cognitive Therapies, Philadelphia, PA, November, 2014. Young, J. F., Benas, J., Schueler, C., Natale, N., Mufson, L., Gillham, J. E., Gallop, R.: The depression prevention initiative: Preliminary outcomes from a school-based randomized controlled trial comparing IPT-AST and group counseling. Paper presented at the annual meeting of the Society of Prevention Research, Washington, DC, May, 2014. Shankman, S., Young, J. F.: Examining the efficacy of Interpersonal Psychotherapy-Adolescent Skills Training (IPT-AST) through systematic pragmatic case studies. Paper presented at the annual meeting of the Society of Prevention Research, Washington, DC, May, 2014. Haimm, C. A., Axelrod, C., Anderson, M., Natale, N., Young, J. F.: Training school counselors in a school-based depression prevention program: Understanding implementation commitment and clinical utility. Paper presented at the annual meeting of the Society of Prevention Research, Washington, DC, May, 2014. Young, J. F., Mufson, L., Schueler, C. M.: Preventing Adolescent Depression: Interpersonal Psychotherapy-Adolescent Skills Training. New York: Oxford University Press, 2016. Tanofsky-Kraff, M., Shomaker, L., Young, J. F., Wilfley, D. E.: Interpersonal psychotherapy for the prevention of excess weight gain and eating disorders. In H. Thompson-Brenner (Ed), Casebook of evidence-based therapy for eating disorders (pp. 195-219). New York: Guilford, 2015. Mufson, L., La Greca, A. M., Young, J. F., Ehrenreich-May, J.: Interpersonal approaches to intervention: Implications for preventing and treating social anxiety in adolescents. In K. Ranta, A. La Greca, L. Garcia-Lopez, & M. Marttunen (Eds. ), Social anxiety and phobia in adolescents: Development, manifestation and intervention strategies (pp. 251-270). Cham, Switzerland: Springer International Publishing, 2015. Young, J. F., Mufson, L., Benas J. S.: Interpersonal psychotherapy as a transdiagnostic approach. In J. Ehrenreich-May & B. Chu (Eds. ), Transdiagnostic mechanisms and treatment for youth psychopathology (pp. 183-202). New York: Guilford, 2013. Mufson, L., Lewis, L. R., Gunlicks-Stoessel, M., Young, J. F.: Treatment of adolescent depression with interpersonal psychotherapy. In M. M. Weissman & J. C. Markowitz (Eds. ), Casebook of interpersonal psychotherapy (pp. 203-223). New York: Oxford University Press, 2012. Young, J. F., Mufson, L.: Interpersonal psychotherapy for adolescents. In C. Essau (Ed. ), Treatments for adolescent depression: Theory and practice (pp. 261-283). Oxford: Oxford University Press, 2009. Young, J. F., Mufson, L.: Interpersonal psychotherapy and prevention. In J. R. Z. Abela & B. L. Hankin (Eds. ), Handbook of depression in children and adolescents (pp. 288-308). New York: Guilford, 2008. Mufson, L., Young, J. F.: Interpersonal psychotherapy. In A. Martin & F. R. Volkmar (Eds. ), Lewis’ child and adolescent psychiatry (4th Ed.) (pp. 819-825). Philadelphia: Lippincott, Williams, & Wilkins, 2007. Young, J. F., Mufson, L.: Interpersonal psychotherapy. In N. Kazantzis & L. L’Abate (Eds. ), Handbook of homework assignments in psychotherapy: Research, practice, and prevention (pp. 85-100). New York: Springer, 2006. Young, J. F., Mufson, L.: Interpersonal psychotherapy for the treatment of adolescent depression: A guide to techniques and implementation. In H. Steiner (Ed. ), Handbook of mental health interventions in children and adolescents: An integrated developmental approach (pp. 685-702). San Francisco: Jossey-Bass, 2004.